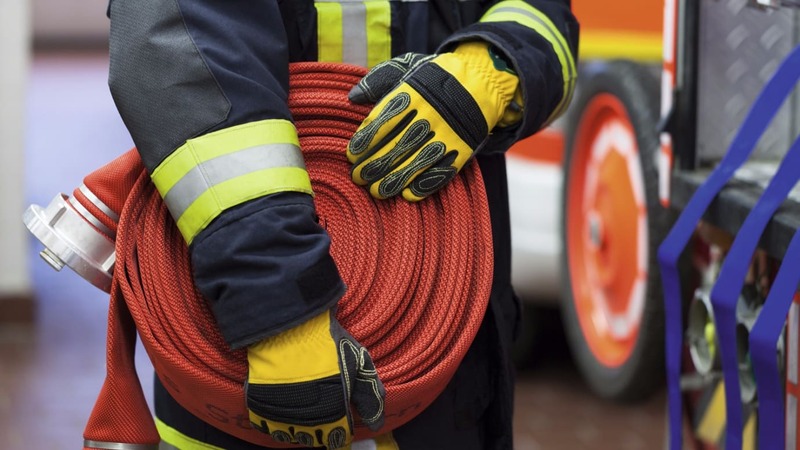 This article focuses on a European project that aimed to stimulate the development of a new type of protective clothing: Smart@Fire. The project led to a smart textiles prototype suit for firefighters that offered optimal protection, as well as the possibility to measure and monitor crucial information including personal parameters, e.g. heart rate and body temperature; and environmental parameters, e.g. concentration of gasses and positioning. When making the prototype, emphasis was put on being easily producible in large scale at an affordable cost. The prototype that was selected via the pre-commercial procurement process of the project shows how protective wear in general might look in the near future. Every year, more than 100 firefighters in Europe lose their lives while trying to saving others. So, it is no wonder that further increasing the safety remains a key attention point. One technological development that has a large potential to contribute strongly is wearable and smart textiles. Indeed, to reduce the risks associated with firefighting, innovative ICT-solutions should be developed and integrated in smart personal protective equipment (PPE). The current ICT-solutions available on the market do not yet provide full satisfaction and need to be fine-tuned. We wanted to tackle those two key points by organising a broad consultation among firefighters on what is really required and by stimulating the emergence of the industrial value chain via the implementation of a so-called pre-commercial procurement process. Ultimately this should lead to a first tender for a real first procurement of the novel solutions. The first step within the project was to take stock of the real needs from the side of the firefighters, based on a European wide questionnaire. Based on a large scale needs assessment of 961 fire brigades the innovation potential from the procurer’s side was identified. The goal was to respond to those specific requirements and to integrate them in the firefighters PPE. The findings and insights gathered at the market consultations were summarised into a final report and allowed the setup of a Joint Pre-Commercial Procurement, or PCP in short, among procurers from several EU countries. PCP is a phased approach for purchasing research and development services by procurers for the development of innovative products, services or processes by enterprises/research centres that are not yet available on the market. The overall goal is to solve socio-economic challenges and to improve the performance and functionality of public services. One of the key advantages of PCP is the sharing of both opportunities and risks by the public buyers and the private suppliers. It allows public purchasers to get innovative solutions to satisfy challenging needs, and support enterprises in their research and development. Solution design phase - Asks for a detailed technological description of the solution. Prototyping phase - Asks for the production of a single first prototype. Batch production phase - Asks for the production of a set of 10 identical products which are intensely field tested. To start this PCP process, an open call for participation was launched for companies to join and to participate in the first step. From all the participants, a selection was made of the most promising designs and only those were invited for the second step. This in turn led to three first prototypes, of which two were selected to participate in the third and final step. This final step of the PCP approach was intended to yield and demonstrate prototypes that would facilitate future purchase of ICT-enriched firefighters’ gear. Only one of the field tested prototypes could be considered as successful, although it is not yet a fully final product. This solution was the so-called smartPRO suit. A key issue for exploitation and commercialisation within the PPE market is certification and the development of testing and certification standards as this PPE market is subject to legally imposed certification procedures. For the moment there are no such procedures or official guidelines on how to certify novel PPE developments that do not follow the design criteria for which the current standards and certification schemes have been developed in the past. Within Smart@Fire, project partner Centexbel was looking into possible solutions using the current framework of testing and certification of both PPE and electronic devices. Centexbel is a notified certification body for firefighter suits and is working together with partners knowledgeable in testing and certifying electronic components. The status at the end of the project was to advise the teams that participated in the PCP process to have their prototypes certified both as PPE and as an electronic device that has to withstand the working conditions of firefighters. The complete PPE system (turnout gear with electronics) is subjected to the standard PPE (textile) testing and certification – this part can be performed by a notified body for PPE certification. The electronic components are evaluated for compliance with the respective EU legislation for the type of electronics and that their specifications meet the requirements of the environment they will be exposed to, e.g. use in firefighting equipment. This is achieved by the manufacturer itself providing the necessary technical information and, if necessary, by performing some verification testing. An evaluation needs to be made on the reliability of the electronics under the conditions of use and how the safety of the user is affected by any loss of functioning (risk and hazard analysis). If necessary, the effective functionality of the PPE system (turnout gear with electronics) during (extreme) use has to be evaluated by testing. As a consequence of the lack of harmonised approach and guidance towards the certification of smart PPE, the EC has issued the ‘Standardisation Request’ M/553 as relates to advanced garments and ensembles of garments that provide protection against heat and flame, with integrated smart textiles and non-textile elements for enhanced health, safety and survival capabilities. This standardisation request has been accepted by CEN and CENELEC and both CEN/TC 162 protective clothing including hand and arm protection and lifejackets/ WG 2 resistance to heat and fire of protective clothing and CEN/TC 248 textile and textile products/ WG 31 Smart Textiles have agreed to work together on developing the requested standards and other standardisation deliverables. The standardisation request M/553 has two main topics. For one, the development of a testing and evaluation standard, which will supplement the current standards used for CE marking personal protective clothing towards CE marking of smart protective clothing. For another, the development of a selection, use, care and maintenance document for smart personal protective clothing. This was a European FP7 project that ran for a duration of 52 months, from November 2012 to February 2017. It involved 11 partners and was coordinated by VLAIO, the Flanders Innovation and Entrepreneurship agency. Smart@Fire included five potential purchasers of the smart firefighter suits: Greater Manchester Fire and Rescue Authority (UK), National Disaster Response Agency of The Netherlands, Service Départementale D’Incendie et de Secours des Bouches du Rhône (France), City of Dortmund (Germany) and the Federal Public Service Internal Affairs of Belgium. The partnership covered the following six countries: Belgium, The Netherlands, France, Germany, United Kingdom and Hungary. The smartPRO suit is based on a certified three-layer protective suit for firefighters, which is designed mainly for extinguishing interior fires under extreme conditions for temperature, fumes and/or orientation in space. The suit is equipped with 12 active LED lights that are fixed on the main reflective tape. The integrated light sensors can also activate four different lighting systems, based on these 12 LEDs, to provide as optimal as possible light conditions irrespective of the environment in which the firefighter is operating. The suit is also equipped with a sophisticated electronics system consisting of sensors, an alarm and a so-called Suit Control Unit (or SCU). The system can continually monitor and evaluate the safety of the environment in which a firefighter is operating: temperature inside and outside the garment, moisture, humidity, detection of toxic gases. The suit also provides information about the physiological functioning of the person inside as well as on the exact location of the person on a map. In case critical values are exceeded for one or more parameters, the smart system automatically activates both an acoustic and visual alarm, which alert the firefighter as well as the coordination officer via his or her Commander Control Unit (or CCU). He/she gets a warning signal as well as the actual measured value of the parameter(s). Furthermore, the coordinating officer can also check the activity of the team (e.g. if a firefighter is standing, lying, running, hanging or falling), monitor physiological functions like heart rate and follow the persons location on a map, both outdoor and indoor. Clearly, the system enables easy detection of ‘issues’ and provides improved means for coordinating the team during the operation. All measured data can also be made available on-line to officers of a higher rank. Furthermore, all data received from the SCU can be downloaded and saved for later analysis, operation and/or training assessment or, if applicable, to investigate the cause of an accident. All values of critical limits that are predefined by the manufacturer can also be modified to meet the individual needs of every user. We now highlight in more detail two key aspects of the winning suit: the smart glove and the localisation system. The smartPRO suit can be equipped with special smart gloves. The gloves include two temperature sensors that enable the measurement of the temperature on the glove surface and also the temperature of distant objects. The firefighter can check the measured values by looking at the LED bar that is integrated in the glove. This bar indicates the temperature using a simple ‘traffic light method’, i.e. a green, amber or red light is shown. The intervention coordinating officer can also see the exact measured values on his CCU (Commander Control Unit). One of the key requirements for the novel smart PPE was the integration of an accurate localisation system compatible with extreme firefighting working conditions. The selected solution has proven an accuracy of less than 30cm. The system is based on the DUNE localisation system, which is easily installable on various types of boots. The boots should be equipped with motion sensors as this enables localisation inside of buildings where the GPS signal is missing. This tracking inside the building is a real novelty and allows following the rescuers very precisely within a building and to define meeting points or locations that are potentially dangerous. The whole localisation system can be easily made compatible with and integrated in the ‘smart system’ of the firefighter’s PPE. The team that provided the selected smartPRO suit consists of the following Czech company members: Applycon s.r.o. who took the lead of the team, Elitronic s.r.o., Holik International s.r.o. and Vochoc s.r.o.. For research and development support the University of West Bohemia was also included in the team. Further, the team could count on Dune s.r.l. who acted as a sub-contractor to provide the localisation system. A graphical overview of the team together with the core expertise they brought in is given in the figure below. The team composition shows very well that working out solutions like this requires a truly multi-disciplinary approach. Thanks to the pre-commercial procurement process, the project realised and extensively field tested a novel type of smart PPE for firefighters that includes real-time continuous monitoring of parameters of both the firefighter and the environment, which provides detailed localisation and communicates all data in real-time for coordination. By showing that a multidisciplinary team can live up to the challenge of manufacturing a smart PPE solution that fulfils the broadly supported firefighter end user requirements, the project also contributed to establishing the necessary novel industrial value chains that will be required to manufacture smart textiles. Also the focus on standardisation and the development of basic concepts for certification of smart PPE will be of future use in this dynamic domain. Clearly, Smart@Fire showed that smart textiles for PPE are very close to reality and to market maturity. The important next step will be the first actual procurement order for smart PPE. Also from the EC side, smart textiles in general and for use for PPE are in the picture, as expressed in the recently published “Smart Wearables: Reflection and Orientation Paper”3. Smart@Fire (2012-2015) was financed by the European Commission (FP7 – Grant Agreement 317898), Innovation Agency (IWT), the Belgian Federal Home Affairs Ministry (IBZ) and the French SDIS13 Fire Department Bouches-du-Rhône.